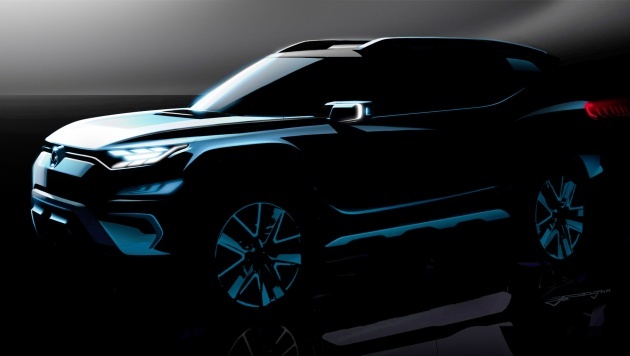 SsangYong has built so many SUV concepts that it’s difficult to keep track of them all, but the 2017 Geneva Motor Show will see the debut of yet another one. The SsangYong XAVL (short for eXciting Authentic Vehicle Long) is inspired by the original Korando from the 1990s, much like the first XAV-Adventure concept. While the official teasers show that the car still harks back to 4x4s of days gone by, the XAVL features a more modern design compared to the retro pastiche that is the XAV-Adventure, with a sleeker profile, cleaner surfaces and slim, futuristic head- and tail light units. The interior also sports a more contemporary dashboard, with a Jaguar-style rotary gear selector and a freestanding display that’s very BMW-like. Unlike the XAV-Adventure, the XAVL will seat seven – hinting that the production car will be offered in two sizes, following in the footsteps of the Tivoli and Tivoli XLV. There’s no hybrid four-wheel drive powertrain like on the XAV-Adventure; instead, power will come from a choice of petrol and new clean-burning diesel engines – likely the Euro 6-compliant 1.6 litre units from the Tivoli, mated to either a six-speed manual gearbox or an Aisin six-speed auto.